A strategic approach to executing optics manufacturing and precision optics solution. Optics are extremely application specific. QCSS can support design and manufacturing of custom optics from a prototype up to a large quantity mass production scale. QCSS' expertise lies in the strength of its wide manufacturing partnerships. Leveraging decades of optics design and manufacturing experience among its principals and partners, QCSS supplements internal design and manufacturing resources with close manufacturing partnerships built over the last decade. To help you realize your requirements, QCSS can provide the following design and manufacturing services. QCSS can start with raw functional requirements (field of view, available light, sensor requirement) to develop custom optics for your application. 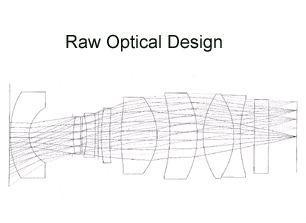 For more information please take a look at our Optical Design Process. Production of optical components requires a very high degree of precision along with sophisticated test and measurement equipment to verify output quality. QCSS Core strength lies in the manufacture of optical components including traditional grind and polish, plastic injection molding, and even glass molding. Mechanical design of the lens fittings and mountings holding the individual optical components is just as important as the optical elements themselves. In order to achieve accurate imaging, all of the mechanical components must be built and fit precisely. In addition to design and manufacturing, QCSS can provide complete solutions for final assembly. Leveraging the extensive supply chain in Taiwan, QCSS can build and procure complete electro-mechanical assemblies. Please see our Custom Solutions for a sample of full optical assemblies.